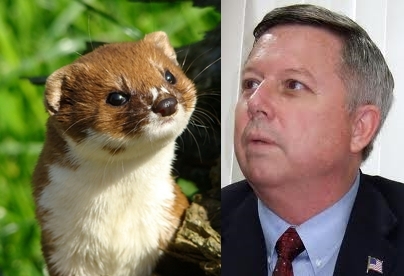 Heineman has said it wouldn't be a good use of time or money to investigate each nomination, especially since the vast majority are legitimate. 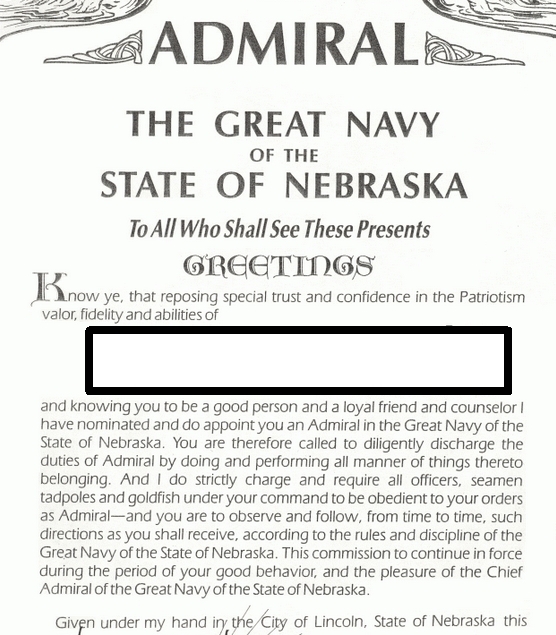 An Admiralship in the mythical navy of Nebraska, a landlocked state, confers authority over "seamen, tadpoles and goldfish." 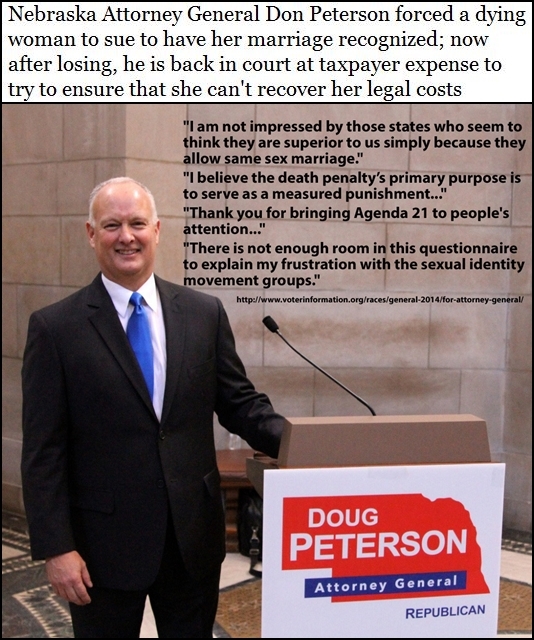 NE judge slaps down antigay GOP AG, says Doug Peterson's request "defies common sense"
Lancaster County District Judge John Colborn clarified an earlier ruling striking down the state's 1995 ban on gays and lesbian foster parents and in so doing has sharply rebuked Nebraska Attorney General Doug Peterson, who has repeatedly squandered tax dollars by pursuing various legal maneuvers to forestall gay marriage. 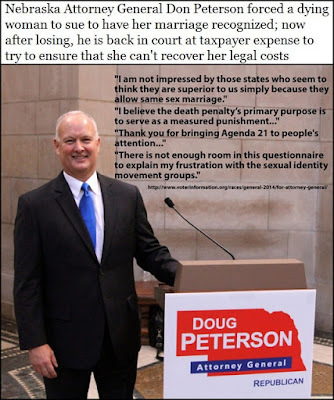 Peterson unconvincingly argued that Colborn had erred in overruling the state's LGBT ban, since the state discreetly stopped enforcing the prohibition in 2012. Colborn's amended order said it “defies common sense” for a government agency to adopt a new policy without rescinding or replacing a previous policy that was at odds with the new one. This is different. No, not Big Red's downward spiral in college football, but the attitude of Alex Lewis, one of six Husker co-captains this year, who takes the game in stride (Former powerhouse Nebraska is 2-3 this season.) Coach Riley is scheduled to talk to Lewis about his behavior. On May 11, 2013, the former transfer from Colorado and a fellow CU teammate were involved in an altercation in Boulder, Colo., that left one man unconscious. Lewis was convicted of misdemeanor assault and sentenced to 45 days in jail, though it was delayed until last summer so he could complete his spring classes. The account we read, at CollegeSpun, was written by Andrew Holleran. No, not that Andrew Holleran, who wrote this novel which is being made into a movie. Here they are in 2010, performing "Oh, Betty!"